From new construction to existing residences, Butler Pavers can cover any patio, lanai or pool deck with pavers, bricks or other materials that are as much works of art as they are surfaces to walk on. We can cover virtually any size or shape surface, from simple square patios to freeform lanais and pool decks. We take great care to protect existing landscaping in the vicinity of the job site, as well as surrounding neighbors and the neighborhood. From the time we show up to the time we clean up, Butler Pavers takes care of customers' needs and wishes. If your pool looks out of date, we can make it look like a million bucks without costing you a million bucks. 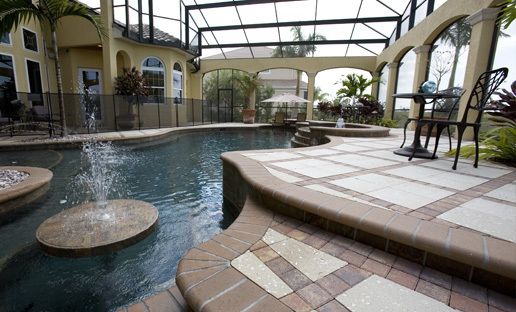 Butler Pavers can do new construction as well as renovations, and in addition to paving pool decks, Butler Pavers can dress up the edge of your pool or assist with drainage problems. From natural-looking paving stones to cobblestone patterns to rustic bricks, the material used to cover a pool deck or patio defines that space, accentuating comfort or drawing visitors' breaths away. No matter what purpose your patio serves, Butler Pavers has the product and pattern for you. Here are a few examples of what Butler Pavers has to offer.